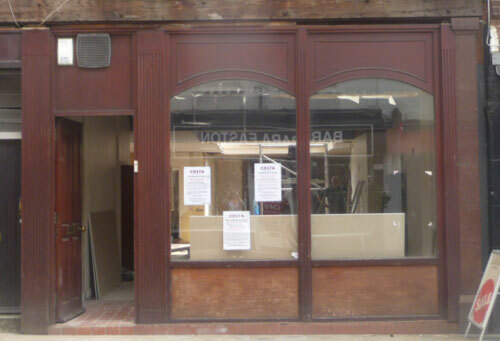 Costa Coffee is going to open in the old Royal China restaurant on Duke Street which has been closed since 2008. The shop is currently being refitted and is advertising vacancies on the door. It will obviously provide some more employment in Henley, smarten up a shop front but do we really need another coffee shop in Henley? With another independent retail shop “Last Man Standing” closing its doors in the last couple of weeks, we really need to support local shops. Let us know what you feel about this by completing the comments box below. When another (very) small independent coffee shop opened its doors a few months ago, another independent coffee shop flexed their influential muscle and had it closed down instantly. I’m all for ‘keeping it local’, but it would seem others only like it when it suits them and their own pockets. What goes around comes around eh…. Has Lorraine Hillier heard about this?! It won’t be open for long!! Yes James – odd you ask if I have heard about it? Some may think you are being personal! Anyway good news. Tardy reply – I must have better things to do with my time.